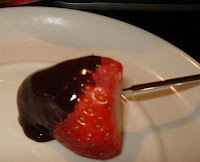 This is a super-simple chocolate fondue recipe is great for a nice, quiet at home date (and did I mention how inexpensive it is?). If you don’t have a fondue pot, don’t fret, you can serve this straight outta the pan. If you don’t get down with the amaretto feel free to replace it with any liqueur you like (try: Grand Marnier or Kahlua, mmmmm). Dippers: Bananas, Strawberries, Pound Cake (feel free to use whatever other dippers you prefer. Apples, brownies, pineapple or marshmallows also work well). In a small sauce pan, bring whipping cream to a boil. Remove from heat and stir in chocolate until smooth. Stir in amaretto and serve in fondue pot on low (if applicable). 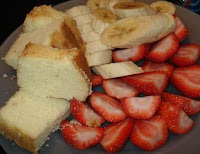 Top with sliced almonds and serve with chopped bananas, strawberries & pound cake on the side.